This is the discussion thread for our first film of the HITCHCOCK Movie Club, Rear Window. Discuss anything that comes to mind about the film -- the directing, performances, casting, set design, etc. I watched this yesterday. I want to preface my comments by saying that I've seen very few movies from this era. A few thoughts that came to mind: I prefer the ladies fashions as depicted in the movie to the fashions of today. Ladies dress appeared to be both more elegant and more feminine back then. I am really not a fan of either the pant suits or the risque attire that are popular today. Secondly, Grace Kelly is incredibly good looking, and Jimmy Stewart has quite the presence as an actor. I am also struck by how slow paced these movies are compared to the contemporary movies that I grew up watching. Not very much happens in this movie, and what little does actually happen, is seen from inside the apartment window. Also, I've lived in an apartment complex for years, and I've never seen scantily clad women doing anything from my window (although, unlike Jimmy Stewart's character, I haven't gone looking for it.) Does this actually happen, or is it just a movie convention? Thematically, this movie, like "Vertigo," appears to explore the dysfunctional nature of romantic relationships. Is this a common theme in Hitchock's movies? I would say that "exploring the dysfunctional nature of romantic relationships" is a frequent secondary theme in Hitchcock's movies. Or maybe it's the main theme, and the suspense/mystery/action framework is just a pretext. Let's see what you think as we go on. Too bad we don't have Suspicion or Notorious on the schedule. 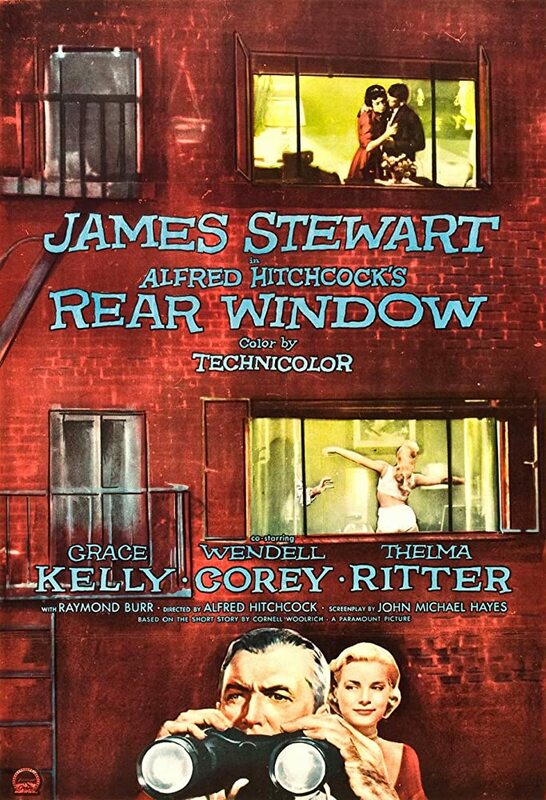 Rear Window was based on a Cornell Woolrich short story, "It Had to Be Murder," which (according to Wikipedia anyway) was in turn based on an H.G. Wells story, "Through a Window." So you can't say it's just a movie convention. On the other hand, in real life, I'm pretty sure most people who live in buildings like that have and use blinds or curtains. That poster makes it look like Miss Torso is in danger! AKA, you mention the slower pace of these movies compared to what's out today or during our time, but did you like the film? Has anyone seen Disturbia, a 2007 thriller with Shia LaBeouf? It's about a teenager on house arrest who believes his next door neighbor might be a serial killer. It was obviously compared to Rear Window when it came out. I haven't seen anything like that often at my apartment complex... in college I heard some interesting things at my apartment complex. I also like that Raymond Burr has an important role in this. He doesn't have to do a lot here, but he really had great onscreen presence (check out an episode of Perry Mason, for instance). I watched this yesterday. I want to preface my comments by saying that I've seen very few movies from this era. A few thoughts that came to mind: I prefer the ladies fashions as depicted in the movie to the fashions of today. Ladies dress appeared to be both more elegant and more feminine back then. I am really not a fan of either the pant suits or the risque attire that are popular today. Since you haven't watched too many classic films, you may not be familiar with Edith Head, who is the costume designer in this film. Whenever I've seen the most gorgeously dressed women in a classic film, I look to see if Edith Head was the wardrobe designer, and nine times out of ten, she was. During her career Head was nominated for 35 Oscars, and won eight times - more than any other woman in history. Did you find the suspense building though, or was it below your radar? This is The Master of Suspense at work, slowly building the story -- little bits and pieces along the way. As an audience member, we're in the same boat as Lisa, Stella and Det. Doyle -- at first we don't believe Jeff, maybe he's a little crazy. He's definitely voyeuristic and it's distasteful, but slowly... we are reeled into the drama right along with all of them. Move to Greenwich Village, and you tell me. Hitchcock made a point of discussing how hot it was and showing the thermometer over 80 degrees. I noticed in one scene there is an electric fan running. Not sure when exactly central air was the norm, but obviously they were trying to keep cool with the windows open and the blinds/curtains letting the air come in. So if you're gonna be like that for a few weeks, I guess your inhibitions give way to basic comfort -- who cares who is watching, as long as you're not sweltering from the heat. Although, a murder and cover-up is probably going overboard. But, Miss Torso wasn't really that scantily clad for a dancer. They would normally practice and perform in similar attire. Also, who noticed Hitchcock's cameo? Matt, I noticed Hitchcock's cameo and the brighter colors, and I was aware of the suspense building. I wasn't familiar with Edith, but she is definitely very talented. Winning that many Oscars is incredibly impressive. Christopher/Matt, I don't really know how I fully feel about these movies. I think that so far, I'm a little underwhelmed by Hitchcock. Of the three that I've seen, I still like "Dial M for Murder" the best. They are all definitely decent movies, but had I not known that Hitchcock was viewed as one of the best directors of all time, I wouldn't have thought that these movies would be as popular as they are. That's part of why I wanted to participate in this challenge, to try to figure out what I might not have been previously aware of that has made him such an acclaimed director. However, I think the norms for films were different in the 1950's than they are now, so it's kind of difficult for someone who was not alive in that era and who was not familiar with movies made in that time, to judge, using contemporary norms, the quality of these films. Christopher, I think I've seen "Disturbia," but I don't remember it. Rear Window is my favorite Hitch film and I think his best, more or less. Why? First of all, I like the slower pace of this film, but I never see it as slow, because there's always a reason to be engaged in the action. I love the isolation of Jeff, I love the fact he's never quite sure if he's seeing what he thinks he's seeing, I love how he obsesses over his neighbors and the guilty pleasure it brings him, I love the look of the film, I love how Hitchcock works around the limitations of his setting, both on a technical level and on a story-telling level. Thematically, this movie, like "Vertigo," appears to explore the dysfunctional nature of romantic relationships. Is this a common theme in Hitchcock's movies? I'd be interested in what ways you think this movie explores the dysfunctional nature of romantic relationships. I think the overriding theme of this movie is the nature of voyeurism, which appears in other Hitchcock movies as well. And of course it's quite meta, before anyone was using that expression, because what is movie watching if not a form of voyeurism. Also Hitchcock loved creating challenges for himself, and this is, I think his best example, of making an exciting movie that basically all takes place inside one location. He did something similar in Lifeboat and in Rope, which has a further challenge of creating the illusion of one long take. Now days these sorts of challenges, on a technical level, are nothing, but it was a bit more complicated in the 50s. I've seen Disturbia, too, in the theatre and liked it okay. There's also a remake that starred Christopher Reeves, which was interesting, considering his condition, but I remember the movie itself not being particularly notable. I didn't watch Rear Window for this but I may watch it again within the next week. Doug, this is a great question. I'm so happy that you are participating in our discussion. Of the three Hitchcock movies that I've seen so far, "Dial M for Murder", "Vertigo", and "Rear Window", they are at heart suspense stories, but the dysfunctional nature of romantic relationships seem to either be central to the plot or a subsidiary theme. Let me explain. In "Dial M for Murder," a husband wants to kill his wife because she has committed adultery. He hires someone else to kill her, but that attempt is unsuccessful, and the movie is in part about how, because of his failure, he has to continue to interact with her while at the same time seeking to conceal both his crime and the contempt for her that led him to hire a hit man to kill her. It's also about how he seeks to manipulate the man who reluctantly seeks to become his hit man by seeking to set him up as a way of manipulating him to do his bidding. The detective in the film helps the wife to slowly come to terms with the fact that her husband has tried to kill her as well. "Vertigo" revolves around a husband who, again, seeks to kills his wife, this time because he is carrying on an affair with another woman. It's also depicts love in many forms, many of which are presented as manipulative or coercive. Jimmy Stewart's character falls in love with who he believes is his friend's wife. They don't know each other at all, but he somewhat voyeuristically comes to desire her while following her around, and becomes romantically involved with her, which is a betrayal of his friend. She, in turn, he thinks, comes to fall for him as well. We later learn that the woman who Jimmy's character believes to be his friend's wife is actually a look-alike who only pretends to be her. Out of what I presume to be love for Jimmy's friend, she actually conspires to murder his wife, then agrees to cover it up and enlist Jimmy's character as an unwitting co-conspirator in their evil act. It's incredibly dysfunctional to murder your wife because you are carrying on an affair. It's even more dysfunctional for your mistress to help you carry out that murder, help you to cover it up. When Jimmy Stewart's character meets the imposter for what he believes to be the first time, he disturbingly tries to force this new woman to look, act, and in some cases, be, the woman he fell in love with. But, he forces her to conform to an image of her that is only in his imagination, because he never really knew the woman to begin with. She agreed to try to make herself into his false construction of her, because she, in turn, has fallen for him. She is hoping that by making enough changes, he will also fall for her. This is obviously a strategy that is doomed to fail from the very beginning, because no matter how much one person may look like another, they cannot ever become that person. We all have our own temperaments, personalities, and eccentricities, and while we may superficially resemble other people, none of us can inhabit the body, mind, or spirit of another. Rather than recognizing that his desire to have the imposter do just that is undesirable, impossible, and unlikely to give him the results he is looking for, Jimmy's character attempts to quasi-force the new woman to act like his old love. This is, in part, at least subtextually, a social commentary on relationships and on how each person has different expectations about what the relationship can or should be, and reinforces that seeking to fulfill each others often ill-defined or impossible fantasies is often the cause of their downfall. In "Rear Window," a husband, again, seeks to murder his wife. Their relationship is depicted as dysfunctional because we see them arguing through the window. In addition, Jimmy Stewart's girlfriend also clearly loves him, but he almost certainly does not love her in the same way. She, again, due to her love for him, hangs around with him in the apartment and seeks to help him recover from his injury and to solve the case that has become the object of L.B's true affections. Jimmy Stewart's character is in love with getting to the bottom of the case, but what his girlfriend is hoping is that by hanging around and helping him with the case she will become the true object of his affections, and that she will succeed in getting him to fall in love with her. However, Jimmy Stewart has made it pretty clear that he doesn't see their lives traveling in the same direction. He doesn't want her to accompany him on his journeys as a photographer, and he doesn't act as if he loves her throughout the film. He passively accepts her food and her company, but he doesn't have a desire to move the relationship forward in the ways that she does. She, on the other hand, acts in ways that demonstrate that she does, by for example, bringing her small suitcase to his apartment as a way of showing him that she, too can live out of a small suitcase. All 3 of these movies have a consistent theme, which is expressed in varying degrees, that relationships, or at least the ones Hitchcock has consistently chosen to portray, are inherently dysfunctional. Hitchcock also appears to be intimating that each partners shifting desires, expectations, motivations and infatuations can cause them to conduct themselves in ways which are either desired to coerce the other person into feeling the way that they do, or which motivate them to seek to sacrifice harm, or alter the lives of others. Those who are either the objects of their own affections, or who need to be discarded in pursuit of the satisfaction of their own selfish, romantic ends. AKA, that was a great comparison of the relationships in these three films. I think one of the reasons some of us love Hitchcock is for these reasons.They're not stories of the happy, conventional husband, wife and two kids suburban household. There's a dark undertone that shows the problems in relationships -- sometimes to an extreme. Ms. Lonelyheart in Rear Window cries herself to sleep every night because she's alone. She finally gets the courage to go out there and try to find love, and instead, the man she brings home assaults her. In her despair, she contemplates ending her life. But, there is also hope in Hitchcock's films: she winds up finding someone who is right for her and we assume gets her happy ending. These aren't the pretty relationships so many other films were showing in these time periods. They are realistic though because life isn't that easy and love isn't that perfect. And then there are subtle touches of Hitchcock humor, like when Miss Torso's husband/boyfriend shows up and he's not at all what you expect him to be -- and he goes right for the refrigerator even when she's trying to shower him with affection. I love that part of the film. But there is one scene when Hitchcock breaks out and actually takes the camera up close so we can see the neighbors more clearly ... shifting from a subjective to an objective point of view, if you will. It's a key scene in the movie, maybe THE key scene in the movie, and it involves not something we see, but something we don't see. Does anyone know the scene I mean? PS, great post, AKA. And a great discussion so far, everyone! Me. But I knew to look for it. I will say that the relationship between Lisa and Jeff isn't all that unusual in movies of that time period, or really even today, of the woman wanting more of a commitment than the guy is ready to give (or thinks he's ready to give). (Have you ever seen My Man Godfrey? Talk about giving the man no say in marriage.) I would say he does love her but he sees himself through his work and his work only has meaning for him if he's out traveling the world, and he knows she's not the type to deal with the inconveniences and the dangers of what they would experience were she to travel with him. Of course, all good storytelling is going to include conflict, so that's their conflict, but during the course of the movie he comes to see how much courage and tenacity she has, and though they were in love when the movie starts, they're now more in love. I love the touch at the end, though, when she's dressed all practical and reading a travel book, but then she sees he's asleep and picks up her fashion magazine. Yeah, I noticed that. I also noticed another scene when Jeff falls asleep and the camera swings over to show us Burr's character leaving. I imagined the camera going, "oh, hey, he's asleep, now I can do my own thing." I will say that the relationship between Lisa and Jeff isn't all that unusual in movies of that time period, or really even today, of the woman wanting more of a commitment than the guy is ready to give (or thinks he's ready to give). (Have you ever seen My Man Godfrey? Talk about giving the man no say in marriage.) I would say he does love her but he sees himself through his work and his work only has meaning for him if he's out traveling the world, and he knows she's not the type to deal with the inconveniences and the dangers of what they would experience were she to travel with him. Of course, all good storytelling is going to include conflict, so that's their conflict, but during the course of the movie he comes to see how much courage and tenacity she has, and though they were in love when the movie starts, they're now more in love. Interesting perspective, Doug. Thanks for sharing. It's really interesting that I had the opposite reaction to you. What does everyone else think, does he love her? I felt like he was infatuated with her, but didn't really have any deep feelings towards her that were shown. Since she was pretty, liked him, and treated him well, he kept her around. I didn't feel that he really desired for them to have any kind of real long-term future together, and I don't think it was just about his job. KC, what scene are you referring to? Interesting perspective, Doug. Thanks for sharing. It's really interesting that I had the opposite reaction to you. What does everyone else think, does he love her? He was comfortable with her. Too comfortable for his liking. He may have loved her, but he was bored of their relationship. When she pulls out he realizes he didn't want to be without her, but it was too easy to win her back -- he just had to say "When am I going to see you again", and she relented. The moment she brought him dinner from 21 and he just looks at it with a predictable shrug and no enthusiasm, I didn't think he had any true romantic feelings left for her -- just obligation and routine. They had nothing in common, until... Lars Thorwald's wife went missing and they were both caught up in finding out what happened. When he saw her adventurous spirit, he realized that she was HIS girl, and he was proud of her. And if they were ever in love before, it was reignited, and better than ever. So I think the love may have been there, but that it went from an almost platonic, dull relationship to a potentially long-term one. Don't give it to us yet! I'm not done thinkin about this. On another note, did we ever find out why the dog had to die? What was in the flower bed? The knife and the saw. He moved them before the ladies came to investigate, because the dog had gotten too nosy.